easy reach of the Yorkshire Dales National Park and the Forest of Bowland Area of Outstanding Natural Beauty. 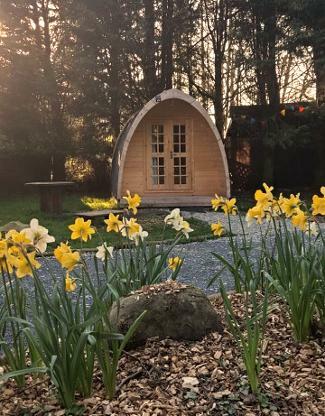 We now have a Basic Camping Pod that is warm and comfortable which is a great base for those on walking, motorcycling, or cycling holidays. The pods are on a “Bring Everything but the Tent” basis. On site you will be just two minutes walk from the Plough Inn public house, six miles from the market town of Settle and 10 miles from Skipton. There are lots of pubs, shops, tearooms and even a castle to explore! A perfect base to explore the Dales or the Forest from, be it on foot, by car, motorbike, or bike! Willowbeck Farm lies close to the Settle to Carlisle railway line, which will take you through 73 miles of spectacular countryside in the Yorkshire Dales and the North Pennines. You can also join up with the Leeds and Liverpool Canal for boat trips or the cycling trail to Leeds, where there's heaps of independent shops, pubs, bars and museums and galleries. There's heaps to do a little further afield, such as visits to spectacular medieval ruins including Bolton Abbey, set among 30,000 acres of parkland, or the Fountains Abbey UNESCO World Heritage Site. Yorkshire Sculpture Park – a huge open air gallery filled with pieces from British and international artists – is an hour and a half away Willowbeck Farm touring caravan site, Settle, Skipton, grass pitches, electric hook up, mains water, chemical disposal point, shower block, 4G phone signal, Yorkshire Dales, Forest of Bowland, mountain biking, walking, climbing, cycling, motorcycling, motorcycles welcome, bikers welcome, Gargrave, Grassington, Three Peaks walk, value for money by car. Excellent Mobile Phone Reception, most providers have 4G on the site!